Alfa Laval's Business Principles describe the way we must act within society whilst achieving our business goals. By aspiring to our Business Principles, we can find many opportunities to contribute to a more sustainable future and deliver better everyday conditions for people. The Business Principles help us ensure that we are acting in a way that does not infringe on human rights, the environment or our business integrity. We can never be complacent about our progress of implementing the Business Principles because there are always aspects in which we can improve. Nevertheless; we like to be a performance-driven company, operating with strong ethical principles which extend through the supply chain and in which employees are proud to work. This helps us to offer excellent value, quality and security for customers and investors alike. Alfa Laval is committed to provide a safe, healthy and attractive working environment for its employees. We value a culturally diverse, flexible, motivated and competent workforce. We recognize the right of employees to freedom of association and collective bargaining. We must understand our responsibility as an employer and as a business partner, but also as a neighbour and an actor in society. Alfa Laval works to optimize the use of natural resources in our own operations. As part of this commitment, we work continuously to make our products in an energy efficient manner, reducing the amount of carbon dioxide we emit, using only the necessary materials, reducing waste and minimizing the use of water. The Environmental Strategy towards 2020 applies to the entire Alfa Laval Group. Alfa Laval is dependent on the business performance of its suppliers for future success. No chain is stronger than its weakest link and we work continuously to identify and improve our suppliers’ performance. The highest priorities are to improve the health and safety, labour conditions, and the working environment of our direct suppliers' employees in high-risk countries and industries. Operating our business with integrity is essential to ensure that we live up to the expectations of our stakeholders. Our stakeholders should be able to depend on us to conduct our business in a responsible and fair manner. 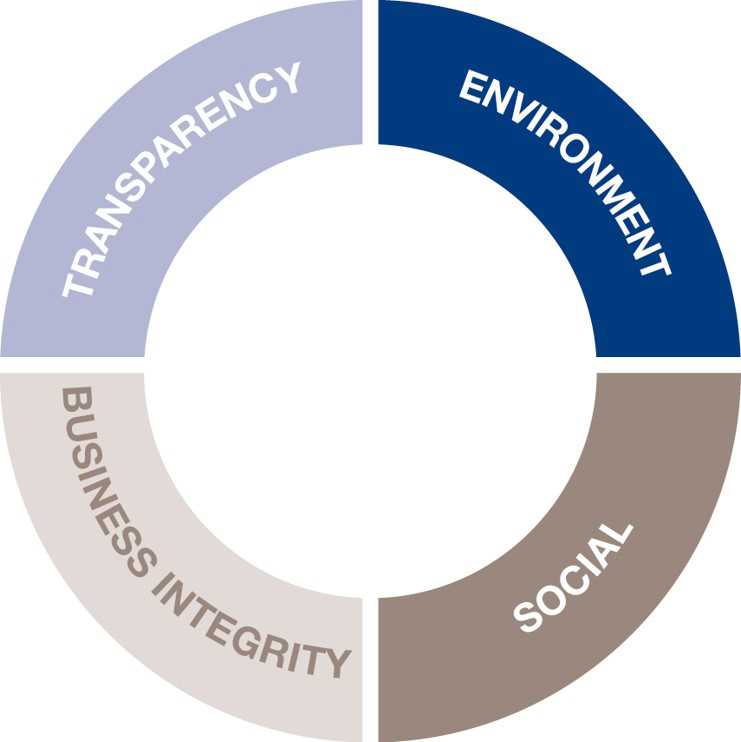 One of the four Business Principles that describe the way Alfa Laval must act within society is business integrity, this principles includes the work against bribery and corruption, anti-competition, conflicts of interest and political contributions.